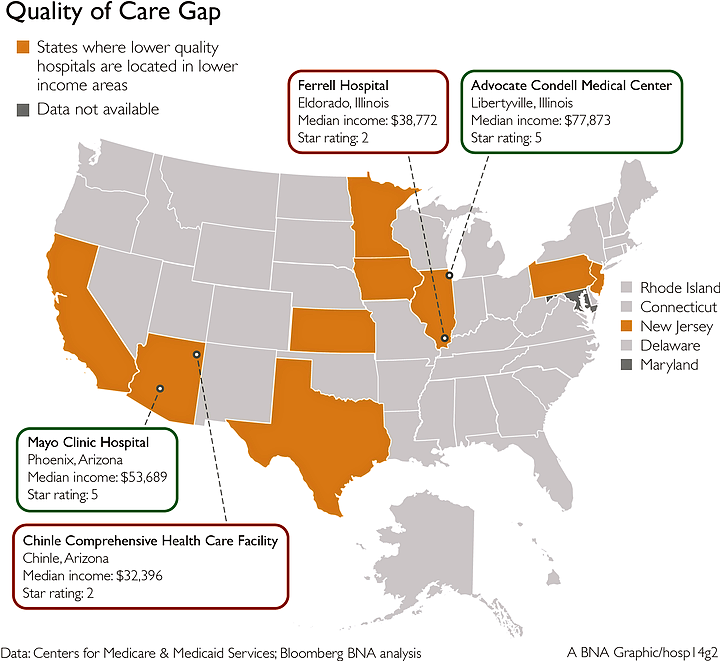 Sept. 14 — Hospitals in low-income counties tend to score poorly on quality measures, underscoring that beneficiary demographics aren't accounted for in hospital ratings, according to a Bloomberg BNA analysis of Medicare and census data. Bloomberg BNA analyzed Medicare ratings data for hospitals and U.S. Census data, finding relationships between a hospital's star rating and the demographic makeup of the facility's location. Hospitals with lower ratings are more likely to be located in counties with larger minority populations, according to Bloomberg BNA's analysis. This pattern holds up nationally. In addition, the analysis found that in nine states, hospitals with low star ratings are significantly more likely to be located in counties with lower household median income. For example, Chester County Hospital in West Chester, Pa., received five stars for overall quality under the Medicare rating system. Chester County, Pa., has a relatively high median household income level for Pennsylvania—$86,093. Chesnut Hill Hospital in Philadelphia garnered two stars for overall quality. The median household income in Philadelphia County, is $37,460, which is relatively low for the state. Likewise in Arizona, the Mayo Clinic Hospital in Phoenix, located in a relatively high income area of the state, received five stars for overall quality. Chinle Comprehensive Health Care Facility in Chinle, Ariz., where median household incomes are lower, garnered two stars for overall quality. A similar pattern exists in Texas, the Bloomberg BNA analysis found. Methodist Sugar Land Hospital in Sugar Land, Texas, received four stars for overall quality. The county where Sugar Land is located has a high median household income for Texas—$86,407. Starr County Memorial Hospital, located in Rio Grande City, Texas—where the county's median household income is about $23,000—has a two-star rating. The other states where this pattern is present are California, Illinois, Iowa, Kansas, Minnesota and New Jersey. Hospital industry executives weren't surprised that low star ratings correlated with serving larger minority populations and lower household incomes. Several of them told Bloomberg BNA the analysis highlights the need for the Centers for Medicare & Medicaid Services to adjust the star ratings to account for patients' socioeconomic status. The Bloomberg BNA analysis combined publicly available data from the CMS on the most recently released hospital star ratings and demographic information from the U.S. Census Bureau. The overall hospital star ratings faced strong opposition from industry and Congress before the planned unveiling of the system in April, which caused the CMS to delay unveiling the system by three months. In July, the CMS posted the overall hospital star ratings for individual hospitals on its Hospital Compare website (145 HCDR, 7/28/16). Prior to the July update, the Hospital Compare website had separate ratings for different quality measures, such as patient experience, outcomes, safety and readmission rates. Under the overhaul of the system, Hospital Compare took 64 existing quality measures and summarized them into a unified rating of one (the lowest possible score) to five stars (the highest possible score). The integrity of the hospital star rating system is only as good as the underlying measures used to rate a facility's performance, Beth Feldpush, the senior vice president of policy and advocacy at America's Essential Hospitals in Washington, told Bloomberg BNA Sept. 12. And the system lacks integrity because the individual metrics used to calculate the overall rating aren't adjusted for patient socioeconomic factors, Feldpush said. AEH is an industry group for safety-net hospitals. For example, patients discharged from hospitals that treat more low-income populations are more likely to have trouble accessing health-care services, Feldpush said. These access issues, she said, affect star ratings, because those patients are more likely to be readmitted to the hospital, a factor that weighs negatively in a star rating. In fact, the readmission measure is one of the biggest factors that affect a facility's overall star rating, Janis Orlowski, chief health care officer at the Association of American Medical Colleges (AAMC) in Washington, told Bloomberg BNA Sept. 12. The AAMC is an industry group for teaching hospitals. The CMS could also make the star rating system more fair by accounting for other factors related to socioeconomic status, such as access to follow-up care or transportation, Feldpush said. Beneficiaries with limited transportation options may find it more difficult to make it to follow-up appointments, which increases the likelihood of being readmitted. Orlowski said a hospital's readmission rate often is directly related to beneficiaries' ability to access follow-up care. Beneficiaries living in wealthy suburbs are less likely to be readmitted to a hospital because they typically have easier access to doctors and pharmacies or face fewer transportation barriers compared with patients living in low-income areas, she said. The hospital star ratings for individual facilities, which the CMS designed to show a hospital's quality of care, are so flawed that “I would suggest that consumers don't use them,” Orlowski said. Nancy Foster, the vice president of quality and patient safety policy at the American Hospital Association (AHA) in Washington, told Bloomberg BNA Sept. 12 that an analysis the group did on the star ratings data found there was a correlation between socioeconomic status and a hospital's star rating. Hospitals that serve more patients with low socioeconomic status were more likely to receive lower star ratings. The AHA is the largest U.S. hospital industry group. Foster also said she'd caution against using the star ratings as a proxy for a facility's quality. To illustrate the point, Foster explained that many teaching hospitals, which are widely regarded as providing high-quality care, generally received fewer stars. For example, well respected academic medical centers like George Washington University Hospital and MedStar Georgetown University Hospital, both in Washington, have 1-star ratings under the Medicare system. The AEH, for its part, has requested many times that the CMS make adjustments for socioeconomic status, Feldpush told Bloomberg BNA. There seems to be traction on the issue, according to Feldpush. For example, the National Quality Forum, a nonprofit group in Washington that works with health-care organizations to improve quality, has shifted its position on adjusting quality measures to account for patients' socioeconomic status and now recommends doing so, she said. And, the CMS has adjusted for socioeconomic status in other programs, Feldpush said. For example, the CMS has carved out a socioeconomic status adjustment in star ratings for Medicare Advantage plans. “I'd like to believe the CMS is paying closer attention to the issue,” Feldpush said. Failing to do so would result in a cycle of hospitals that treat high volumes of low-income patients being paid less because of star ratings and creating a wide gap among acute care hospitals receiving federal reimbursement, Feldpush said. The AHA, in its research on the stars program, found that hospitals that reported on fewer quality domains generally received higher star ratings, Foster said. A total of 64 quality measures go into determining a hospital's overall star rating. Those 64 measures are categorized into seven different domains. Hospitals that reported on fewer domains generally fared better under the star system, Foster said. Some hospitals may not report on certain measures if they don't perform services related to that metric, or perform too few services on a metric to meet reporting requirements. Bloomberg BNA's analysis found a weak correlation between reporting fewer domains and having a higher number of stars. Large hospitals, which perform many services and need to report in more domains, could end up with lower ratings than smaller or specialty hospitals that are reporting in fewer domains. The AAMC noted other problems with the individual measures that went into the star ratings. For example, hospitals that didn't have a high volume for a particular patient service were scored by the CMS as meeting average requirements, rather than not counting the measure at all, Orlowski told Bloomberg BNA. There was a better chance of a hospital receiving one, two or three stars if it reported on all 64 measures, Orlowski said. However, if a hospital reported on 60 percent or less of the individual measures, it had a higher chance of getting five stars, she said. If the methodology was fair, a greater number of small hospitals would have scored lower in ratings, the AAMC's Orlowski said. Instead, under the current system, many small hospitals that report on few measures were rated as five-star facilities. Physician-owned and nonprofit hospitals are significantly more likely to have higher ratings, while proprietary and government-run hospitals are significantly more likely to have lower ratings, according to Bloomberg BNA's analysis. Orlowski said this could be because some physician-owned hospitals may not have enough volume to report on all individual measures that go into the star ratings. The AHA's Foster said many physician-owned hospitals tend to be focused on single conditions, such as treating only heart disease or conducting orthopedic procedures, and thus didn't have enough volume to report on all the domains. The very fact that doctors have ownership stake in those hospitals is why they do so well, John Richardson, the executive director of Physician Hospitals of America (PHA), an industry group in Washington, told Bloomberg BNA Sept. 13. There are many types of physician-owned hospitals, including “general acute care, rural, multispecialty, single specialty rehab, pediatric, women's, psychiatric, long-term acute care and teaching hospitals located in both urban and medically underserved areas,” Richardson said. And, those hospitals have varying ownership models that range from full ownership by doctors to joint ventures with nonprofit and for-profit hospital systems. However, physician-owned hospitals are prohibited from expanding under the Affordable Care Act, unless they qualify for an exception. “Our industry is so confident in the physician ownership model that we are advocating for Congress to pass legislation that would allow hospitals with physician ownership to expand only if they have demonstrated consistent quality of care so that patients will benefit,” Richardson said. “This is the essence of H.R. 2513, introduced by Rep. Sam Johnson (R-Texas) with bipartisan support. “We are willing to hold ourselves to a higher standard of care that the big hospital lobby would never agree to for themselves. Why should a hospital be allowed to expand at will if they are providing low quality of care? Patients suffer in those instances,” Richardson said. 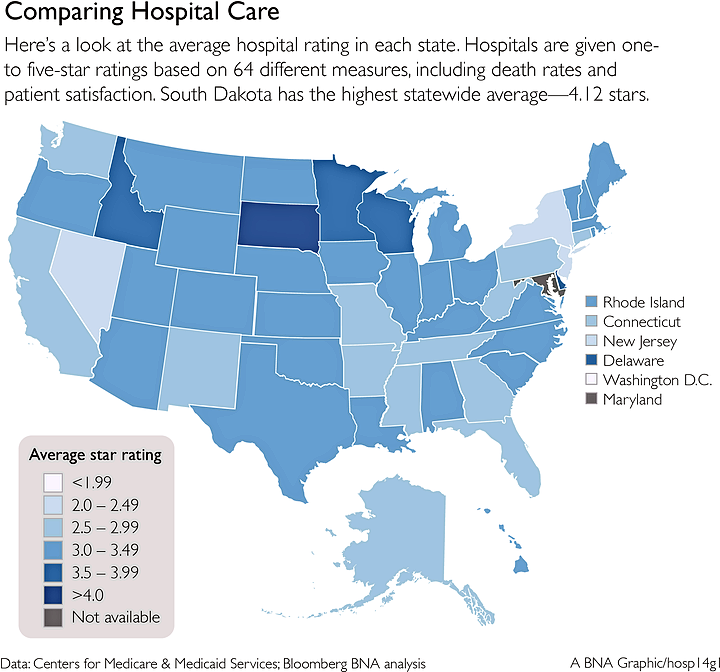 It's not clear how or whether consumers are using the star ratings data, but poor ratings have the potential to harm a hospital's reputation, Orlowski told Bloomberg BNA. Building a reputation takes a long time and the star system may be hurting facilities that have worked for years to cultivate a reputation for quality, Orlowski said. Some hospitals with a high number of stars have already advertised their rating, Orlowski added. She also told Bloomberg BNA that many local media outlets have published articles touting a facility's star rating in their area. Orlowski also predicted that Medicare payments eventually could be linked to star ratings. There's already a precedent for this happening, the AHA's Foster said. Some of the bundled payment models that CMS has rolled out have prohibited hospitals from making arrangements to discharge patients to post-acute care providers with one or two stars, she told Bloomberg BNA. However, the CMS is unlikely to pursue linking Medicare payments to a hospital's star rating immediately, Foster said. “They want to let the data play out. Quite frankly, I think CMS knows they need to improve some measures before” the system is reliable enough to link it to payments, she added. The AEH, for its part, is worried about the prospect of the CMS using a hospital's star rating to determine payment, Feldpush said. The health-care industry has been moving to value-based payments and hospitals are prepared for some degree of that ahead, she told Bloomberg BNA. However, “[w]e need to make sure that the underlying factors are fair and transparent,” Feldpush added. The CMS could improve its transparency by adjusting for socioeconomic factors so that every hospital has a chance to succeed based on factors that they can control, Feldpush told Bloomberg BNA. In addition, the AEH's view is that the CMS didn't properly explain how it used certain data points to determine a hospital's star rating and it could be more transparent about that in the future. There's been significant bipartisan opposition to the star ratings from Congress. In April, a bipartisan group of 60 senators sent a letter to CMS acting Administrator Andy Slavitt to change the star program to better adjust for treating a high number of patients with low socioeconomic status. Later in April, 225 Democratic and Republican House lawmakers sent a similar letter to Slavitt. In July, Reps. James B. Renacci (R-Ohio), who was the lead signer on the House letter, and Kathleen Rice (D-N.Y.) introduced the Hospital Quality Rating Transparency Act ( H.R. 5927), which would delay for one year the release of the overall star ratings. The bill was incorrectly referred to the Energy and Commerce Committee, Kelsey Knight, a Renacci spokeswoman, told Bloomberg BNA Sept. 13. An identical bill will soon be introduced so that the legislation can be properly referred to the Ways and Means Committee, she said. Renacci said Bloomberg BNA's analysis of star ratings data reflects the underlying concern with the program. “We don’t have all the information CMS is using, nor the exact methodology, to calculate these ratings and some hospitals, such as teaching hospitals, are being disproportionately impacted by the ratings,” he told Bloomberg BNA. Rice said her biggest concern with the new hospital star rating system was that it would unfairly treat teaching hospitals and hospitals serving poor communities unfairly because of possible flaws in the system’s methodology. Bloomberg BNA's analysis “suggests that may be the case,” she said. Many in Congress “pushed CMS to look at this more closely before the system’s release, and we’ll keep working to pass bipartisan legislation that pulls the ratings back for at least one year and requires CMS to make their methodology public so we can independently verify that it adequately accounts for factors like poverty,” Rice told Bloomberg BNA. The Hospital Compare website is at https://www.medicare.gov/hospitalcompare/search.html. Full text of H.R. 2513 is at http://src.bna.com/izI. The senators' letter is at http://src.bna.com/d34. The House lawmakers' letter is at http://src.bna.com/izJ. Full text of H.R. 5927 is at http://src.bna.com/izM.